Even though the New Jersey Department of Transportation (NJDOT) has implemented a variety of individual improvement projects over the past couple of decades, traffic congestion and development pressures have overwhelmed this corridor between Trenton and New Brunswick. Traffic is expected to increase by as much as 55 percent by the year 2020. Without the necessary changes to zoning and subdivision regulations to appropriately direct new development, these transportation investments will be unsustainable. Without an intervention, future traffic projections indicate a corridor of widespread traffic gridlock with a significant increase in commuter travel time. Realizing the importance to coordinate transportation and land use decisions, NJDOT saw the Route 1 Regional Smart Growth Strategy as a potential NJFIT strategy to promote sustainable land use and increase transportation options and solutions. Route 1 southbound in Lawrence is an example of several sections along the corridor where access management issues are a concern due to increasing commercial development. stakeholders in the development of a planning process that can be copied in other corridors and regions across the state. The project aims to increase travel options along this corridor by fixing access management problems and enhancing transit facilities. The Route 1 Regional Smart Growth Strategy is both a proactive and collaborative approach among NJDOT and several municipalities for the development of integrated transportation and land use strategies to achieve a shared vision for the corridor. NJDOT will advance a final set of recommendations that develop from this process. These recommendations will include a specific set of actions for attaining sustainable smart growth objectives in the region. Travel - Increase multi-modal transportation options and reduce the number of vehicles on the road. The Route 1 Regional Smart Growth Strategy centers on a smart growth approach that encourages mixed-use development, redevelopment opportunities and increasing intensities and densities of land uses. A number of workshops have been conducted for the four subareas of Trenton, Princeton, the Turnpike area and New Brunswick to identify areas of congestion, land use and access management issues and possible multimodal transportation solutions. These workshops have led to the development of opportunity zones and growth locations for each of the subareas. Other outcomes include the identification of potential interregional rail and local transit service, supporting land use policies and strategic roadway investments such as local access management measures and improved street connectivity between Route 1 and local street networks to encourage safe and convenient travel options. These travel options range from walking and bicycling to transit opportunities, including a potential Bus Rapid Transit (BRT) system for the region. A BRT Alternatives Analysis study completed by NJ TRANSIT in 2006 evaluated potential routes, station locations and cost effectiveness. The study also adhered to coordination with municipal plans and other related planning efforts. Concept design for "next generation"
Recently, NJ TRANSIT completed a near-term concept plan for the expansion and enhancement of existing bus routes and the creation of new service routes in the Central Jersey Region. The plan provides a phased approach to implementing BRT service along the Route 1 corridor and includes near-term investments such as new vehicles and stations and longer-term transit solutions including dedicated bus lanes and service along the Dinky Line in Princeton. 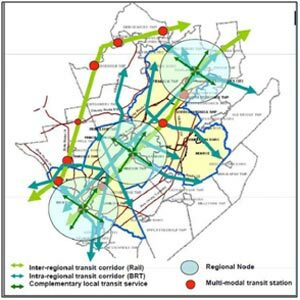 Plan details will be discussed with local, regional, state, private and other stakeholders to advance the concept design for BRT service in the corridor. Building consensus among the counties and municipalities on the growth strategy and related action agenda is important to making this integrated land use and transportation approach a success. The final plan and related action steps for shared implementation by NJDOT, counties and municipalities is expected to be completed in 2011. More information and the final report for the Route 1 Smart Growth Strategy is available.